Licorice root (also liquorice root) is the root and underground stems of an herbaceous perennial plant Glycyrrhiza glabra. Greek, Egyptians, Chinese and other Asian nations have been using Licorice root for flavouring, confectionery applications and medicinal purposes for centuries. It is also known as sweet root and Gan Zao in Chinese. Licorice Root contains a number of healthy compounds such as flavonoids, volatile oils, plant sterols, coumarins, glycosides, asparagine, chalcones, glycyrrhizic acid and anethole. Licorice Root has a peculiar sweet flavour with a faint hint of anise flavour and is sweeter than sugar (sucrose). Licorice has been used for flavouring and sweetness in candies but recently has been replaced with Anise. It is still used as a sweetener in herbal medicines, lozenges/herbal cough candies, and tobacco products. However, studies suggest that along with its a slew of health benefits a key compound in Licorice Root, glycyrrhizic acid, may raise blood pressure levels when used in large quantities on regular basis. Therefore, processed Licorice Root is also available that does not contain glycyrrhizic acid and can be found under the label of Deglycyrrhizinated Licorice Root (DGL root). Licorice Root is known for its antiviral, antibacterial, antiinflammatory,antispasmodic, antioxidant, antidepressant, demulcent and expectorant activity. 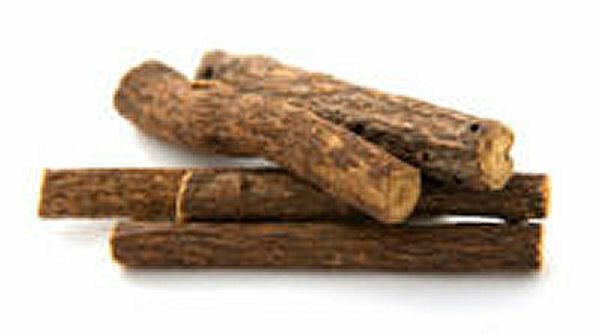 Due to its remarkable healing components, Licorice Root has been used in the treatment of many minor to severe health conditions which include asthma, body odour, chronic fatigue, depression, obesity, sore throat, cold and flu, coughs, bronchitis, dandruff, gingivitis and tooth decay, canker sores, infections caused by viruses such as hepatitis, fungal infections, athlete's foot, heartburn, constipation, peptic ulcer, liver problems, emphysema, psoriasis, shingles, skin rash, hyperpigmentation, baldness, tuberculosis, yeast infections, hormone regulation, mood swings, hot flashes associated with menopause, PMS, muscle cramps, prostate enlargement, bursitis, tendinitis, gout, and rheumatoid arthritis. Deglycyrrhizinated Licorice Root (DGL) is often suggested for high cholesterol levels, arterial plaque and gastroesophageal reflux disease (GERD). Preliminary studies have shown that Licorice root may suppress the multiplication of Human Immunodeficiency Virus (HIV) and might be beneficial for people who are at the risk or are suffering from AIDS. Researches show that Glycyrrhizic acid in Licorice Root may help with depression and anxiety by promoting adrenal gland function. Adrenal glands regulate stress hormones such as cortisol. The depleted stress hormone levels are usually responsible for chronic fatigue, depression, anxiety,and lowered resistance levels to allergens and infections. Also Licorice Root contains Asparagine amino acid which is required to maintain equilibrium by the nervous system. Therefore, drinking one cup of Licorice tea twice daily may be beneficial for depression, anxiety, nervousness and migraines caused by stress. Studies have shown that Licorice Root may regulate the cholesterol levels by improving the bile flow. Researches suggest that bile acids account for cholesterol metabolism and elimination of excess cholesterol in the body. Also the antioxidant activity of Licorice Root may inhibit the development of arterial plaque and improve the capillary health. Therefore, taking one capsule of Deglycyrrhizinated Licorice Root extract daily for 30 days may help prevent cardiovascular diseases and regulate the cholesterol levels. The phytoestrogenic and antioxidant activity of Licorice Root is believed to be helpful for hormonal disorders such as fatigue, mood swings, and hot flashes in menopausal women. Therefore, taking one capsule of Licorice Root extract daily may help balance and regulate the hormone production in women going through menopause. Licorice Root has antispasmodic, anti-inflammatory and a mild estrogenic activity which may help with PMS symptoms such as mood swings, breast tenderness, nausea and bloating, as well as menstrual cramps. Drinking Licorice Root tea starting 3 days before expected period time may help with menstrual cramps, hormonal imbalance and help ease the PMS symptoms. People have been using Licorice Root salves and poultices in the treatment of skin rashes, eczema, psoriasis, and dry and itchy skin. A small clinical study has shown that the demulcent and anti-inflammatory agents in Licorice Root extract gel may reduce the symptoms of atopic dermatitis (eczema). Simply applying Licorice Root extract gel onto the affected area two to three times daily may help relieve the skin disorders. Licorice Root Extract has been used in the treatment of cold sores, shingles and herpes simplex. A few studies have shown that anti viral activity of Licorice Root extract may suppress the progression and recurrence of cold sores caused by herpes simplex virus. In some severe cases topical application of carbenoxolone cream, which is a synthetic derivative of glycyrrhizinic acid, has been beneficial for herpes virus. Simple remedy for shingles, herpes simplex and old sores is to take one capsule of Licorice Root extract twice daily and apply Licorice Root extract gel or ointment on to the affected area 4 to 5 times daily. Researches suggest that saponin glycosides in Licorice Root have an expectorant activity which may help with dry cough, bronchitis, and asthma. An expectorant promotes the bronchial secretions and break down the thick phlegm making it easy to cough it out. The antiviral, anti-inflammatory and demulcent properties of Licorice Root may also help lubricate the irritated and inflamed respiratory tract and sore throat, relax bronchial spasms, and combat viral flu, cold and other respiratory tract infections including asthma. Simple remedy is to drink Licorice Root tea two to three times daily. To make the tea, shred 2 inches of Licorice Root into a boiling cup of water. let it simmer for about 10 minutes. Then strain out the shredded root and drink it warm. To regulate the quantity, Licorice Root tea bags can be used to make the tea. Licorice Root is used to treat many intestinal tract and digestive abnormalities. The flavonoids and chalcones in Licorice Root may help with inflammation and irritation of the digestive tract and the mucus lining of the stomach caused by bacterial infection. Also soothing agents in Licorice Root may soothe and calm the digestion system promoting bowel health. Simple remedy is to drink Licorice Root tea two to three times daily. Licorice Root tea can be made by steeping the tea bag for 10 minutes into a boiling cup of water. A study shows that participants had significant decrease in body fat mass after taking 3.5g of Licorice Root extract daily for two months. However, the consumption of Licorice Root is not recommended for longer periods. Therefore, even though the study suggests the regular use of the herb for two months, it is advised to stop the use of Licorice Root for one week after every two weeks during the two months period. For weight loss, balanced diet combined with regular physical activity may contribute to significant reduction in body fat mass. The overdose and long term consumption of Licorice Root may cause hypertension, hypokalemia (low blood potassium levels), cataracts, and salt and fluid retention. Therefore, it is not recommended for people with heart conditions. However, Deglycyrrhizinated Licorice (DGL) may be a healthy alternative for people who are heart patients. People who are allergic to Fabaceae (legume, pea, bean, or pulse) plant family, can be allergic to Licorice Root too since Licorice Root belongs to Fabaceae family . Due to the estrogenic activity of Licorice Root, it should be avoided by pregnant women. If you are taking any hormonal, or steroid drugs or any other medication or supplements, it is highly recommended to consult with your health care provider to discuss any possible interaction complications Licorice Root may cause. Licorice Root is available at herbal food stores in dried, powdered, capsules, tablets, liquid extracts, gels, ointments and tea blends forms. Deglycyrrhizinated licorice is also available for the treatment of health conditions which can be aggravated by glycyrrhizin in Licorice Root. Hi, I got sore throat due to changes in the weather and I tried every thing but nothing helped. After reading your post, I tried Licorice Root for my throat and it helped me. Thanks a lot. I use licorice root and tea during the winter as I think it boosts my immune system and protects me from colds and the flu. I prefer this method rather than the alternative ' the flu vaccine" I prefer natural alternative remedies as opposed to chemicals, because I think chemicals do more harm. Where can I buy this licorice root and other herbs? Deglycrrhizinated Licorice Root is available at amazon. How should licorice root be used for Emphysema? Is the candy licorice the same as licorice root? Does it have the same healing properties or is it just a flavor added to candy? I would like to know more about using Licorice Root for gout. There is not enough information on how to use it for gout. How do I use licorice root for hair falling out? Where can I buy licorice products here in Manila , Phillipines.